In spring 1990 Jari Sinisalo and Jukka Soini were researching maps to find the ideal location for listening to radio stations from the British Isles. They found a camping site, which became an instant success among Finnish DXers. During the first 12 years, over 230 DXpeditions have been held in Långåminne. Jari and Jukka are among the leading Finnish DXers in hunting for UK radio stations. Luckily, both live close to the west coast of Finland, but neither one has quite ideal surroundings for long Beverage antennas. So the search began. Jukka tells that during the spring and summer of 1990, both investigated maps to spot camping sites that could be used as a DXpedition base. Most sites, especially those right on the seaside, had to be rejected because of lack of space for antennas to the west. Eventually they found a camping site at Långåminne a short drive south from the town of Vaasa. A brief visit to the site confirmed their enthusiasm, to the west there was at least a kilometer of swampy forest, where antennas could be built. One of the cabins was to be reserved for DXers. 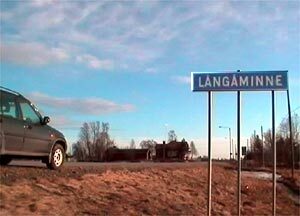 Långåminne is in fact a Swedish name, and this area south of the town of Vaasa is among the few regions in Finland, where the majority of the population speaks Swedish as their native tongue. 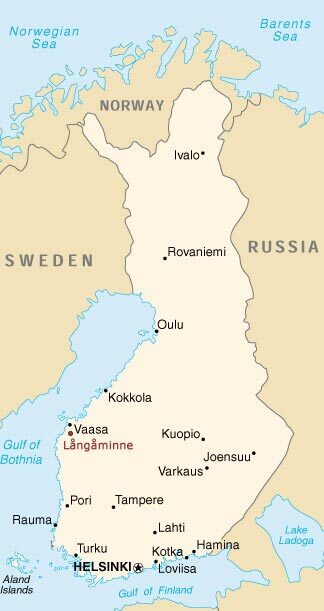 Långåminne belongs to the municipality of Malax (Maalahti in Finnish), where 89% of the population are Swedish-speaking. For the mostly Finnish-speaking DXers this has offered a rare chance to use Swedish in everyday conversation. The first DXpedition LÅ1 was held on October 14-19, 1990, by Harri Kiikeri, Jukka Soini and Tuomo Vesala. Initially, there were no permanent antennas installed, so each DXpedition had to set up and take down their antennas. The cottage that was used first was different from now, and antennas had to be lifted over a tennis court, which was difficult. 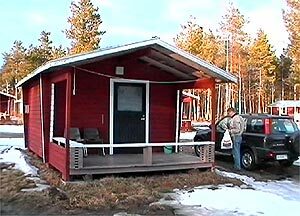 Långåminne is located just south of Vaasa, easily accessible for a weekend DXpedition for DXers even in Southern Finland. Jukka remembers that the results of LÅ1 were beyond expectations. For example on 1584 kHz both Airport Information Radio stations (Gatwick and Heathrow) were heard, the other one of which was never again heard in Finland. Also stations from the La Plata area of South America were heard well. After a few DXpeditions and a lot of sweat in the forest, in September 1991 permanent wires (diameter of 0.7 mm) were erected. They proved to be too thin and would not stand storms and ice, so they had to be replaced at least annually. This was however the practise for several years. Most of the time four antennas were in place, directed at 250, 255, 280 and 285 degrees, so that two listeners at a time would have good wires to both the United Kingdom and Southern South America. The DXpedition site is really a camping site, but there are hardly any visitors during the prime DXing season. Finally, to avoid replacing antennas all the time, a thicker antenna wire was used along with splitters, so that only two wires (up to 800 meters in length) were needed, first at 255 and 285 degrees and a few years later also an antenna for the Iberian Peninsula directed at 235 degrees. As there are only few wires and hardly any outside interference, coax feeds have not been built. Back in 1990 the camping area was owned by Nils Törn, who used to visit the shack every now and then, and even brought his guests - once all the way from New Zealand - to talk with the hobbyists. Ownership has since then changed hands, and there have been no more unexpected visitors, but cooperation with the new owner has been smooth. The cottage houses four people, but in practise it is just big enough for two DXers and all the gear. Långåminne has had the honour of hosting the most international DXpedition ever held in Finland. This took place just before the EDXC Conference of Tampere in 1992. Having just spent one night on the dial at the shack of Per-Ole Stenman further north on the Gulf of Bothnia, Michel Ravigneaux (France), Dario Monferini (Italy), Roberto (Italy), Jaroslav Bohac (Czech) and Henrik Klemetz (Sweden) spent another night of DXing in Långåminne. Maybe there was even one more Czech DXer, Jukka Soini recalls. Långåminne has not faced major setbacks over the years. Sometimes fuses have blown and getting a new one has been difficult. A mouse has been the only truly unwanted guest. Aside from DX gear, not much preparation is needed, because Långåminne is not in the middle of nowhere. You can get a burger at the camping site bar, and the town of Vaasa is near. DXing can however be challenging in the winter, if temperatures dip below -15 degrees Celsius, because then it becomes cold also inside. 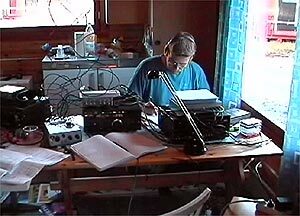 Jim Solatie listening during the LÅ227 DXpedition in March 2002. I asked Jukka Soini if there have been any exceptionally memorable events during the many DXpeditions held in Långåminne. -Jim Solatie had once lent his tape recorder to Jari Ruohomäki when the two were listening, Jukka tells. When Jari heard a rare Puerto Rican station on 1380 kHz, the recorder wouldn't work and he missed the ID. As a consequence, Jim invented a new sport - throwing a tape recorder over the shoulder to the forest. Other than that, no collateral damage has been reported from fierce DXing over the years. Excellent results from the British Isles and South America have made Långåminne one of the most popular DXpedition sites in Finland. If measured by the number of DXpeditions, Långåminne is the most frequently visited one with over 230 DXpeditions held in 1990-2002. However, most of these have been very short, even just 1-2 days. 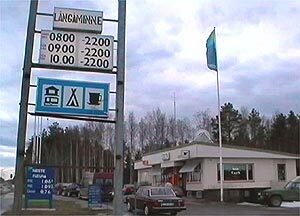 Långåminne is about five hours away from the capital area, so it is possible to go there for a weekend DXpedition. In terms of total listening time, DXpeditions to Lemmenjoki still outnumber those held in Långåminne.